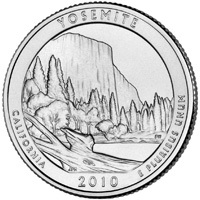 The Yosemite National Park Quarter is the third of 2010 and the third overall in the America the Beautiful Quarters™ Program. Yosemite National Park, one of the first wilderness parks in the United States, is best known for its waterfalls, but within its nearly 1,200 square miles are deep valleys, grand meadows and ancient giant sequoias. It was first established as a national site on October 1, 1890 (26 Stat. 650). The reverse image depicts the iconic El Capitan, which rises more than 3,000 feet above the valley floor and is the largest monolith of granite in the world. Inscriptions are YOSEMITE, CALIFORNIA, 2010 and E PLURIBUS UNUM. Design candidates were developed in consultation with representatives of Yosemite National Park.